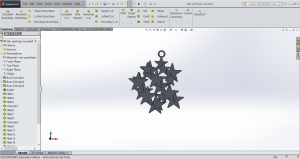 Erin Winick, Founder and CEO of Sci Chic, talked to SOLIDWORKS about her startup business, where she creates and sells 3D printed science and engineering inspired jewelry made of plastics and/or metals. Erin will be graduating this December from the University of Florida with a BS in Mechanical Engineering. She has had 4 internships, namely – Bracken Engineering, Solar Turbines, John Deere and Keysight Technologies. Originally from Tampa, Florida, Erin always enjoyed fashion and science. Besides these, she has a passion for 3D printing, sewing, writing and hiking. 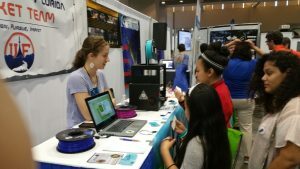 We asked her about conception of the idea behind Sci Chic, to which she replied, “When I was president of the Society of Women Engineers chapter at UF my junior year, we held the first 3D printing outreach day for the organization. I saw the impact that this event had on all of the girls that came onto campus for the event and was motivated to bring this to a larger scale. I have always had a passion for fashion, so combining the two with my love for science was an exciting prospect. 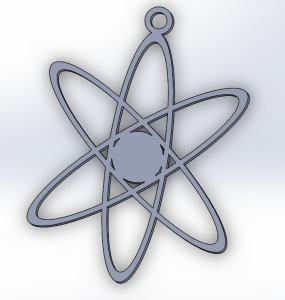 Creating 3D printed science and engineering inspired jewelry has been a blast for me and shown me the reach that a company like this can have”. 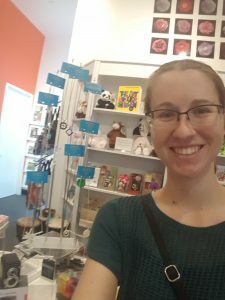 She launched Sci Chic at an Art in Engineering event at a local art museum, and officially started selling products in October 2015. Currently a team of 2, Sci Chic operates at an incubator space in Gainesville called the Selling Factory, about which she remarked, “We have fantastic support from the incubator we are located in”. Alex Anthony, the Communications Officer at Sci Chic, joined the company in December 2015. He helps manage the graphics design, copy editing, and everything from social media graphics to retail packaging. 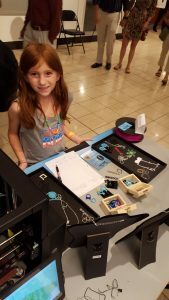 “When we started out it was just my printer I purchased with my own money making plastic jewelry. We have expanded adding more printers and producing metal pieces as well through an outside supplier”, she added. She funded her business from bootstrapping, including a small amount of seed money from her savings during summer internship at John Deere. “Money from sales can be a powerful thing”, she chuckled. 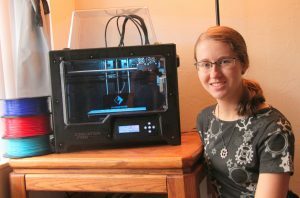 Erin started by making designs in SOLIDWORKS, after she would return home from working at her summer job (John Deere), in Augusta, GA. As a science enthusiast, she turned this inspiration into 3D CAD designs in SOLIDWORKS ready for printing. 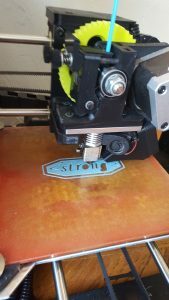 Later that fall, she purchased a Lulzbot Mini 3D printer, and started printing the initial pieces. She shared how over time, Sci Chic has improved the quality of its products, and increased its product offerings. “It is awesome to look back and see where we have come in a year”. 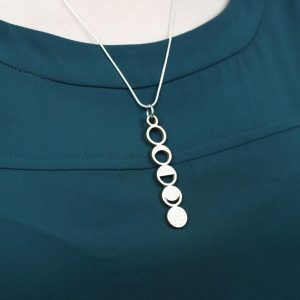 During its early stages, Sci Chic sold jewelry on Etsy or to Erin’s personal network. Now, Sci Chic has its own ecommerce site, has entered retail, and will be launching subscription box service by the end of November 2016. Erin has been using SOLIDWORKS since her freshman year at the University of Florida. She learned SOLIDWORKS in her engineering courses, and continued to build upon her knowledge of the software throughout her college career. She explained, “I started out learning the basic tools in SOLIDWORKS in Computer Aided Graphics and Design Class. Later I learned more about Finite Element Analysis and motion analysis in my classes. The University of Florida provides its students with licenses to use, so I have used this resource in doing most of my designs. I have used everything from SOLIDWORKS 2012-2013 to the 2016-2017 editions during my time in school. My favorite parts of the software to use for my business are the spline tool, properties analysis for densities and weights, and the high definition rendering options available. They are great for creating high quality images to show clients and show my followers previews of what is coming”. The product cycle at Sci Chic, from inception to design to product/prototype, is a fascinating journey. It usually starts out as an inspiration related to science, in school or elsewhere, which Erin then translates into a sketch in the margins of her class notes. 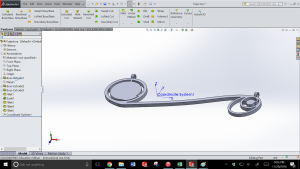 She then starts sketching it in SOLIDWORKS 2D, convert to 3D, decide on the scale, and make an initial .stl file. Then, the design goes through its first stage of print test in PLA plastic on one of their in-house plastic 3D printers. This is followed by multiple iterations, and testing, along with feedback from people in the field or from followers. Erin pointed out, “Going to in person events and getting feedback has been very beneficial”. Once design has been finalized, collaborative design making between Sci Chic and its metal 3D printing supplier about compatible materials follows. This too entails multiple iterations. 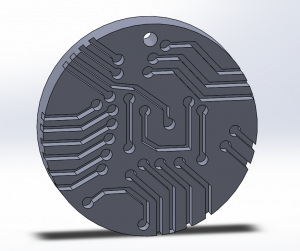 Then, test prints of the metals are ordered and high quality renderings are created. Lastly, initial prints are assembled onto their hooks and chains for photographs. The buyers of this high-tech fashion jewelry range from 11 year old girls to college professors to other fashionistas. “Since we print our pieces in a range of materials, they appeal to a wide market. Kids love our glow-in-the-dark and bright color plastic jewelry, and our most popular pieces with adults are printed in stainless steel. Individuals buy off of our website and museum gift stores and other retail shops buy from us wholesale as well”, she added. Purchases can be made directly via their website. The website is hosted through Shopify which handles the postage. Products are then shipped through USPS. Email notifications are sent out to the buyer with USPS tracking information as soon as the order is fulfilled. Retailers generally contact through the website contact form or direct email. Sci Chic then sends to them its wholesale line sheet, and order form to proceed with next steps. Some purchases are also made through other online retailers namely, Svahausa, Shapeways, and Etsy. Sci Chic does all of the plastic printing internally, and outsources the metal printing. Outsourcing has allowed them the flexibility to offer a variety in type of metals at lower costs; however, it increases the time to delivery to customers. “We like to print our items to order to be able to create the most customized piece possible for our customer, so this increased production time can lengthen shipping. However, creating a bond with another company and manufacturer is great. It is a wonderful business relationship and you can help promote each other”, she added. Erin foresees a bright future for Sci Chic. She reasoned, “Eventually we are going to need to stock up more inventory and do printing to order less frequently. 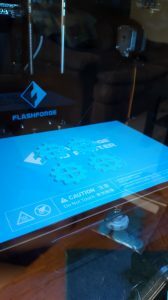 We are also open to using other manufacturing options other than 3D printing if needed, but no matter what we use we want to make it accessible to our customer and give them a behind the scenes look at how their items are made”. Continual innovation and new designs all the time will be the key drivers of the business into the future. 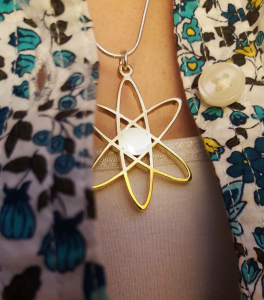 Sci Chic is also collaborating with women in STEM from around the world to make new pieces from all different areas of science and donating a portion of the proceeds to a charity of donor’s choice. Sci Chic is launching its new monthly subscription boxes that pair science inspired fashion with educational information expressing the science inspirations behind all of the pieces on November 25th 2016. Sci Chic Kids will give kids the chance to interact with science in a fun and wearable way for just $19.99/month. 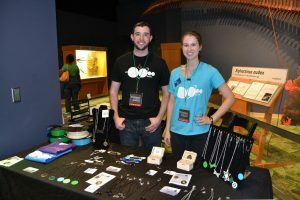 Each box will contain everything from 3D printed jewelry and accessories to a range of STEM inspired wearables ranging from BFF Necklaces and t-shirts to glow-in-the-dark rings and iron-on patches. 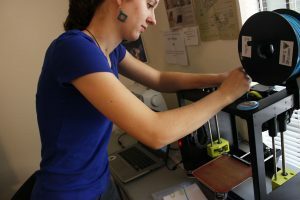 Kids will also have access to behind-the-scenes videos showing the 3D printing of some of that month’s items and educational materials about that month’s science topic. Sci Chic Kids subscription box is a great way to spark every day conversations about science and encourage young girls to explore the creativity and fun in science in a new and inventive way. Sci Chic Monthly will provide a high end science fashion experience for $39.99/month, containing high quality 3D printed metal jewelry, notebooks, scarves, hair accessories and more. Each month box will have a different science topic theme, matching that month’s announced overall area of science. For example, February’s Space box will contain items relating to celestial objects like the moon, galaxies, satellites or the solar system, etc. Erin is a promising entrepreneur who has been able to pursue her interests, as a full-time career, by acquiring the design skills in SOLIDWORKS, and by taking careful steps into the business world. Heartiest Congratulations on completing a successful 1st year of Sci Chic, and best wishes for many more to come. Thank you Erin for sharing your story with the SOLIDWORKS community! I am currently an intern at SOLIDWORKS, and an MBA student at Boston University's Questrom School of Business. I love travelling and distance running.